We’re back from a cruise that took us from Hawaii to Tahiti. But our heads remain in vacation mode, so we’re still craving beach drinks. Royal Hawaiian Cocktail to the rescue! It features tongue-tingling dry gin and lemon, plus pineapple juice for that tropical touch. The Royal Hawaiian Cocktail is one of the few gin-based Tiki drinks (rum is the most popular spirit for Tiki cocktails). Combine that gin with pineapple juice, lemon juice, and orgeat syrup, and you have a pleasant sipper that’s perfect for relaxing poolside. Or enjoying by a crackling fire when you want to remember summer’s warmth. Place all ingredients (except garnish) in a cocktail shaker half-filled with ice. Shake vigorously until the contents are well chilled – about 20 seconds. 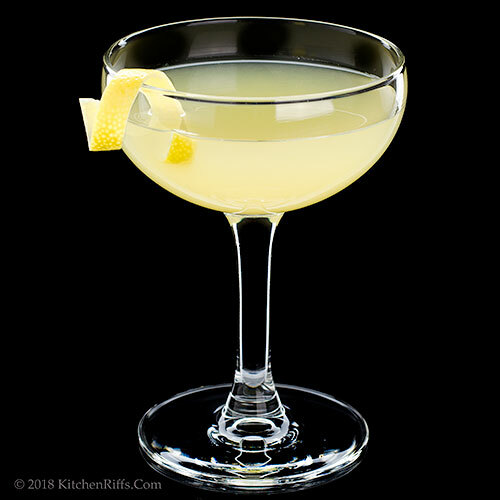 Strain into a cocktail glass or coupe (preferably one that has been chilled). Garnish, if you wish, and serve. This drink is also good served over ice in a rocks (Old-Fashioned) glass. 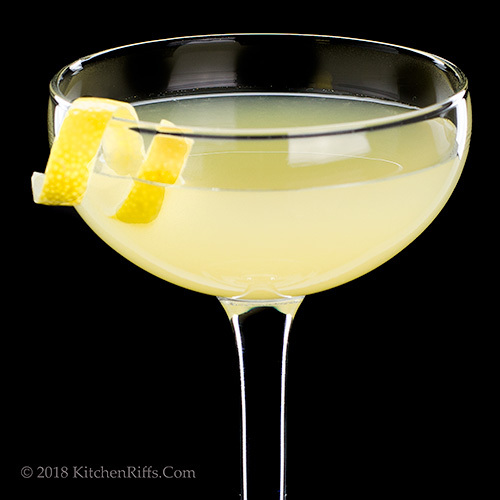 Garnish isn’t traditional for this cocktail, but we like to add a lemon twist. A lemon wedge would also be nice. Any name-brand dry gin will work in this drink. Canned pineapple juice is probably the easiest option for making this drink. We buy it in small cans – they hold the right amount of juice for a couple of cocktails. Orgeat is a sweet almond-flavored syrup (it also contains orange flower water or rose water). You can find orgeat in most good liquor stores or buy it online. Just substitute almond syrup if you can’t find orgeat. The Royal Hawaiian Hotel is located in Honolulu, on the island of Oahu. It opened in 1927 as one of the first luxury hotels on Waikiki Beach. The Royal Hawaiian Cocktail was originally called the Princess Kaiulani, but was renamed in the 1950s. It served as the hotel’s signature drink throughout much of its history (though today that honor is held by another classic Tiki drink, the Mai Tai). “Where Herman Melville was inspired to write his first novel, Typee,” said Mrs K R.
“And on to the atoll of Fakarava,” I said. “Population 837,” said Mrs K R.
“Moorea might be the prettiest place I’ve ever seen,” said Mrs K R.
“And finally ended up in Papeete, on the island of Tahiti,” I said. “The only rough part was the long flight home,” I said. “That was less than fun,” said Mrs K R.
“Which is why we needed one of these when we finally got home,” I said, raising my glass. “I might need another one right now,” said Mrs K R.
Boy, you must have had some shock when you came back to the early winter weather in the Midwest! I'd love to be on a cruise of the South Pacific right now, sipping on these lovely Royal Hawwaiians!! I might never come back. Your trip sounds awesome! So does the drink. I love Hawaii, but haven't ever gotten used to the cocktails. I'm a fan of the Kona Brewing Company and their various beers. In Kona, they brew the beer you drink there, but if you buy their brand in the US it's made in California, as far as I know. Hi Liz, it WAS a shock! Snow? What's that? :-) Thanks for the comment. Hi Mae, there's some really great beer in Hawaii and the South Pacific. Such a fun place to visit. :-) Thanks for the comment. Hi Pat, Tahiti is GORGEOUS! Getting there (and back) is a hassle, though -- long flight, and not that many flights a day, alas. But worth it. Thanks for the comment. Hi Pam, it is! :-) Thanks for the comment. So that is wher you disappeared to! So jealous, that Bora Bora pic, wow. And thta drink!!! Now you need a toddy version. Hi Evelyne, it's definitely toddy weather, isn't it? But our heads remain in the South Pacific! :-) Thanks for the comment. I have a huge bottle of gin in my cupboard screaming to be used in this cocktail! BTW, which tour/cruise operator did you use for the trip? Also, John, thanks so much for supporting my blog. Over the past (almost) 6 years, you have never missed commenting on my posts. Even when you have taken time off from blogging, you have gone back and posted comments on my posts that you missed. I really appreciate it! Hi Anne, this is definitely an antidote for winter doldrums. :-) Thanks for the comment. Hi Fran, we sailed with Regent Seven Seas -- on the Mariner. The ship is currently on its way to New Zealand and then Australia, so you could join her. :-) Thanks for the comment. OMG do I need a cruise right now or WHATTTTTT!! I wish I weren't due for at least another 4 months so my husband and I could go on one post-Christmas!!! Wahhh! We can already tell I am going to be a GREAT mother, right?! LOL! Hi GiGi, you probably really DO need a cruise right now. :-) Thanks for the comment. Sounds like a delicious cocktail, and an amazing vacation! That water!! Serious stunning! Happy to hear it was all so wonderful, and looking forward to more island treats. Hi Valentina, the water is SO pretty there! The lighter color means the depth is shallow; the deeper color indicates deeper depth. Thanks for the comment. I think I stared at that Bora Bora pic for a full five minutes. GORGEOUS! I probably wouldn't have come home :). Glad you guys had a wonderful trip, and thanks for the cocktail that will allow me to pretend I'm on a tropical vacay! Hi Kelsie, Bora Bora is gorgeous! And Moorea is even prettier (although it's just a matter of degree). Thanks for the comment. Hi Laura, we're back to reality, alas. But we kinda like reality, so that's OK. :-) Thanks for the comment. Hi Sherry, in the US whiskey (bourbon and rye both) and gin were the most popular spirits until the 1960s. Then vodka started edging them out, but both are coming back again. Good think -- I like whiskey and gin. :-) Thanks for the comment. The view is stunning and the cocktail is very pretty. Hi Denise, it's a great looking drink, but the view of Bora Bora is better. :-) Thanks for the comment. Welcome back John! What a lovely trip. We were in Papeete many years ago. It was hot. I could have used one of these drinks! *smile* This supposedly well-known evening beverage seems to have arrived at the Royal Hawaiian at about the first time my husband and I visited the Islands after our marriage and, indeed, stayed at the then still great hotel. Since I drink wine and spirits but rarely touch a cocktail - too short for me - I am sorry I do not remember and am learning thru' your post . . .
Hi Abbe, Tahiti IS hot. Soothing drinks are recommended. :-) Thanks for the comment. Hi Eha, I'm guessing you might have seen some of these being served when you first stayed at the Royal Hawaiian, even though you didn't indulge in one -- from what I've read it was pretty popular. Not so much these days, though -- too bad, because it's a good drink. Thanks for the comment. This has me long for SUMMER! The drink sound really great with tropical flavour. Hi Angie, it's a great summer drink! Or for anytime you WANT it to be summer. :-) Thanks for the comment. This looks and sounds like it would be the perfect summertime drink, or as you said looks like a great "pretend it's summer "drink. Thank you for sharing! Hi Anne, we DO like chilly weather, but we're definitely into pretending it's summer at the moment. :-) Thanks for the comment. My goodness what a fabulous trip! You must have had a fantastic time. Great time of year to go too :) Love the drink and the photos - thanks for sharing. Wow, that photo of Bora Bora looks like a place you never want to leave and then you had to come back to the frozen tundra of the midwest... LOL...Thaw out with several Royal Hawaiian cocktails and you will be good to go. Hi Tricia, it was a wonderful trip! Really worth doing. :-) Thanks for the comment. Hi Bobbi, yup, that's been our plan -- thaw out with these. :-) Thanks for the comment. Welcome home, I wish I was your neighbor. I would love to sit with the two of you over this cocktail and hear all about your wonderful cruise aboard the Mariner to all those exotic ports. Yep, John, it's that long flight home that makes it a wonder any of us ever leave home to start with! This drink sounds perfect for me. Going on my must-try list. Hi Karen, it'd be fun to be neighbors! We'll each have to make a round of these, and pretend. :-) Thanks for the comment. Hi Jean, those long flights are killer! Even in business class -- I find it hard to sleep on planes. But this drink certainly soothes the soul. :-) Thanks for the comment. John, I love the Royal Hawaiian Hotel and loved it. I have to make your drink and pretend I am back at the hotel. Hi Gerlinde, fun drink to remember fun times! :-) Thanks for the comment. It's stormy and windy and nothing sounds better than sunshine and a cocktail. An escape to Hawaii would be fab! Hi Deb, I'm ready for another escape. :-) Thanks for the comment. 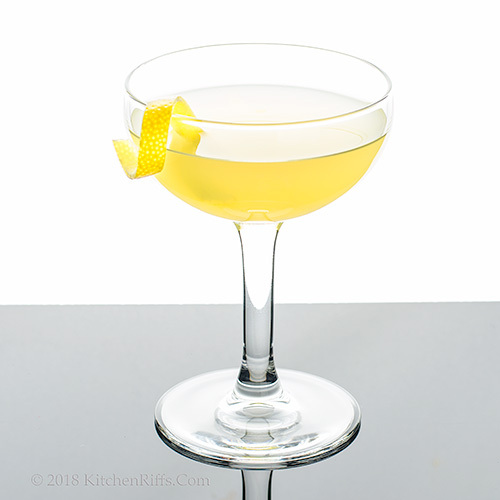 I love cocktails with gin and this one sounds and looks delicious, especially with a touch of orgeat...thanks for sharing the recipe. Have a wonderful rest of week! That sounds like an amazing cruise! No wonder you craved this beautiful cocktail when you got home. I loved hearing about your adventures, thanks for sharing. Sounds like you had a dreamy vacation! I guess I found a new drink to replace my usual mai tai whenever I want to dream of Hawaii! Hi Juliana, this is a terrific cocktail -- SO much flavor! :-) Thanks for the comment. Hi Rocquie, it was a wonderful trip. Can't wait to go on another cruise next year. :-) Thanks for the comment. Hi Laura, hard to beat a Mai Tai! But this is also a really fun one, and less complicated to make than a Mai Tai. Thanks for the comment. Hi Greg, I remember your post about Moorea -- wonderful place. Bora Bora is beautiful, but Moorea is gorgeous! Thanks for the comment. Welcome back John, sounds to have been a great holiday, except for the long flight. That Royal Hawaiian Cocktail looks very drinkable to me. Does the orgeat syrup impart any almond flavor to the drink? Hi Izaa, it is, it is. :-) Thanks for the comment. Hi Ron, you definitely do taste the orgeat -- it adds a very subtle but very distinctive almond note tot he drink. Really nice! Thanks for the comment. Hi Natalia, tastes good, too. :-) Thanks for the comment. I love the use of orgeat syrup in this, John! Maybe we need these tonight! Hi David, orgeat has such a nice flavor, doesn't it? You definitely need to try this tonight. :-) Thanks for the comment. John it sounds like you and the Mrs. had a wonderful trip. What's not to love about Hawaii. This drink is one I'm sure to love. Pretty much anything tropical has my name on it. Hi Vicki, so hard to resist tropical drinks, isn't it? :-) Thanks for the comment. Nice vacation, and what a perfect way to remember it! My husband and I are going to Hawaii this winter. He grew up there, I've never been. Hi Jeff, we had never been to Hawaii either. You'll love it! So pretty. :-) Thanks for the comment. Hi Carolyn, definitely need flip-flops for this one. :-) Thanks for the comment. Sounds like you had an awesome time. I haven’t been on a cruise since my honeymoon a million years ago. Most of our friends love it, in fact, a couple of them are on one right now (they have three booked back to back). Perhaps we’ll have to give it another go sometime, but at the moment we love spending a month in Arizona to take the chill off. Hi Eva, we didn't think we'd like our first cruise -- but we were living in Florida (where cruising is easy), so we booked a pretty nice cruise line to give cruising a "fair" chance. Turned out we really liked it -- pretty good food, good drinks, were in a new place every morning, and only had to unpack once (which for us was a biggie). We like it, a lot, although we can certainly understand why some people don't. Really worth trying at least once. :-) Thanks for the comment. This sounds delicious, perfect for a holiday hit at this time of year! Hi Caroline, it's a wonderful drink! :-) Thanks for the comment. What gorgeous picture of Bara Bara. The colors don't look natural, but,having seen the emerald coast, I know they are. Absolutely beautiful! This sounds like a very refreshing drink. Would love to be sipping it on the deck as I traveling on the Pacific. Hi MJ, agree the colors in Bora Bora don't look like they should be real. Really pretty place. :-) Thanks for the comment. Welcome back John, this beach looks fabulous. It is always hard to get back to routine after vacation. Your drink looks pretty as well, perfect to remember such vacation. What an AMAZING vacation!! This cocktail looks great, too! This drink sounds like something I would love. I could use a cruise right about now. I am sure you both had a wonderful vacation. 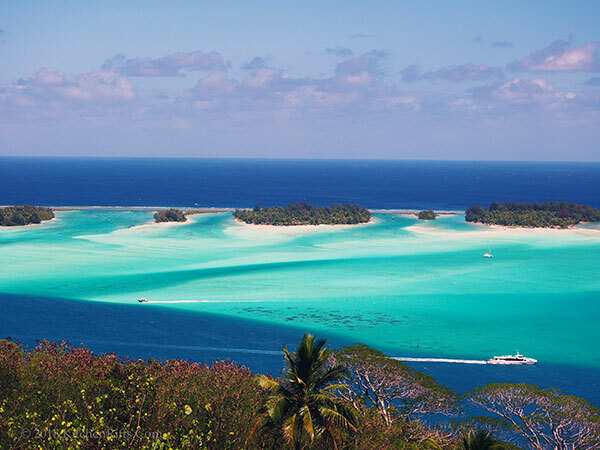 Hi Amira, the beaches and color of water in French Polynesia are amazing! Thanks for the comment. Hi Amy, it was a terrific trip -- we really enjoyed ourselves. Thanks for the comment. Hi Dawn, it's really a nice drink -- super flavor. And the trip was SO much fun. :-) Thanks for the comment. I am so glad you enjoyed the cruise and definitely a cocktail is on the list to relax with when you return. This sounds so decadent and delicious. Hi Merryn, it was a terrific cruise! And this cocktail is a nice way to remember it. :-) Thanks for the comment.